Are you a key business and IT approver, IT Architect, Application Owner or Application user? Join Martin Cooper & Laurence James to learn more about NetApp Hyper-converged Infrastructure (HCI), its use cases, total cost of ownership (TCO) and how it can enable your business. Increasingly, business are focusing on IT as a key enabler for success. This is driving IT teams to expand their knowledge of systems that respond to the changing business landscape, react to new opportunities and counter competitive threats without creating multiple data management silos. 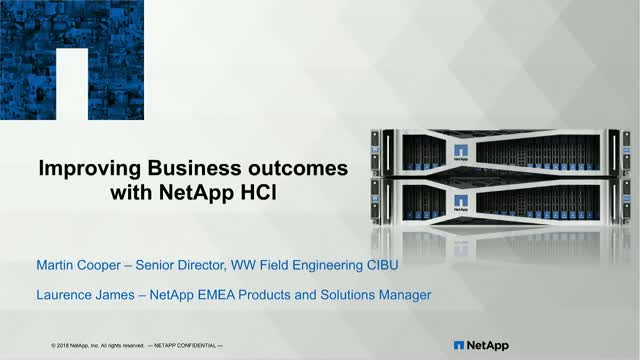 The Design of NetApp HCI lets you flex and scale while consolidating your revenue generating, customer facing, workloads on one infrastructure and, at the same time, guaranteeing quality of service for each workload. As key infrastructure in your digital transformation project, NetApp HCI will support both traditional and next generation applications on the same infrastructure. It enables business and digital transformation on your terms. Join IDC and NetApp for a lively discussion and presentation about breaking free from the limits of today’s Hyperconverged Infrastructure (HCI) solutions. Hear IDC’s views on how and where this HCI market is developing and how you can take advantage of the next phase of HCI - Enterprise Scale. Transform your IT infrastructure with the enterprise-scale NetApp HCI to deliver guaranteed performance, increased agility, and easy automation for high speed deployment, management, consolidation and control of business critical enterprise business applications. Are you ready for next ? – to change how it has been done – into how fast and simply it can be done.